Menu Item Groups is a great new feature that adds further flexibility and customization to your menu. Menu items can be grouped together under one menu button allowing further organization and easier accessibility. 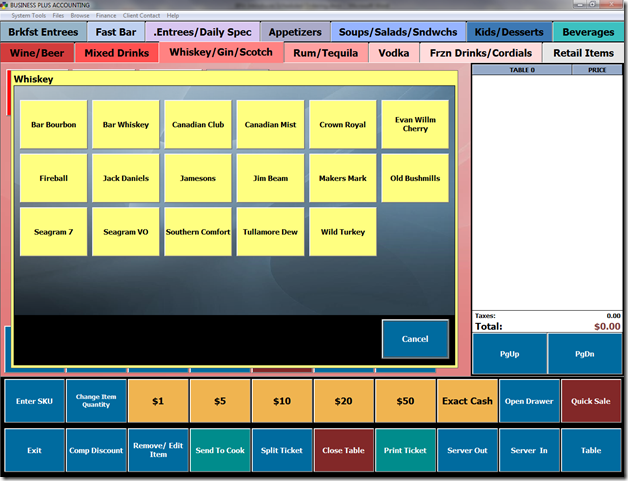 This feature is particularly useful for bars and pizza shops. Below we have an example of an alcohol menu. 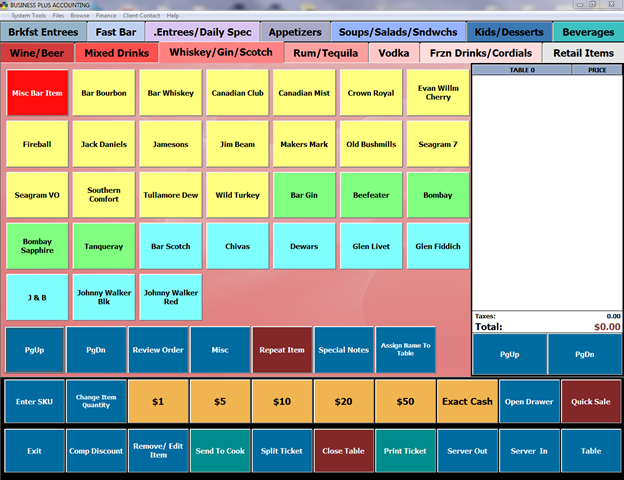 As you can see, drinks are grouped together by color and liquor type. This works well until you add too many buttons on one menu. 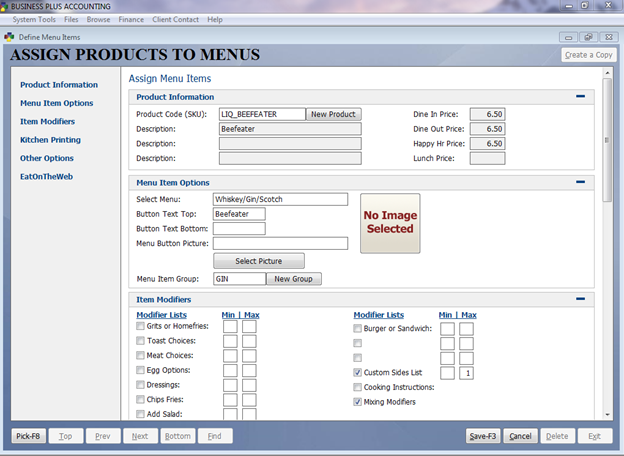 Below, we see the same menu with the menu item group functionality implemented. We now have one button for each liquor type with a plus symbol indicating it is a menu item group. 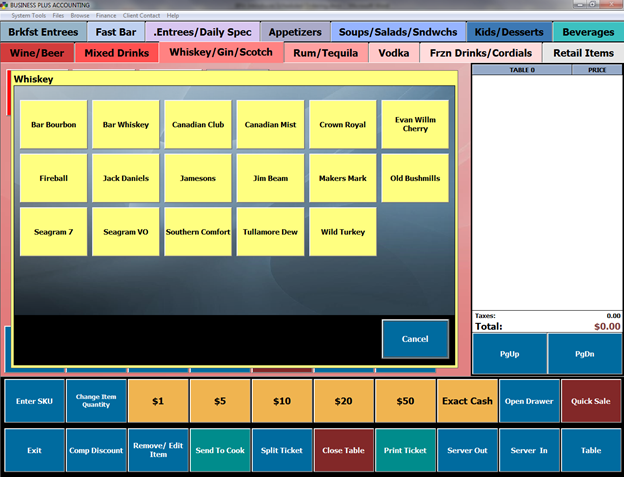 When we click the Whiskey button we get a popup menu with all of the original menu items that were on our original menu. These menu items have all the same flexibility with modifiers, side lists, and special pricing that they would have if they were directly placed on a menu tab. As you can see, this allows you to better organize your menu and effectively use valuable menu space. 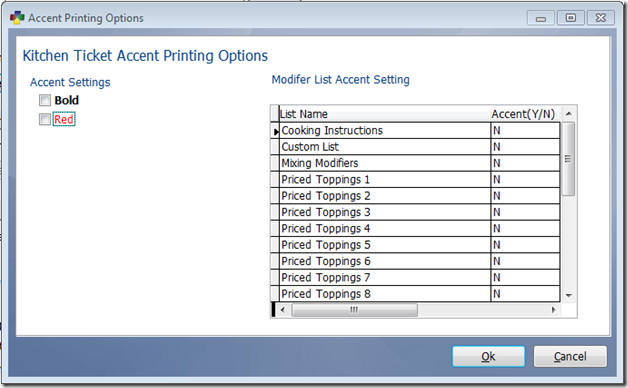 Setting up menu item groups is a simple process. Before you get started you will need to make sure your BPA software is up to date. You must have a software update applied 11/12/13 or later to take advantage of this functionality. Please contact Business Software Solutions to receive an update. As a reminder, updates are free of charge to customers who are current on their monthly license and support fees. 1. 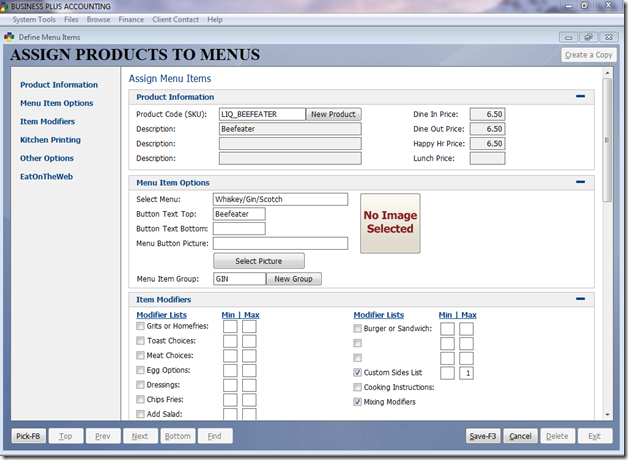 Open BPA and navigate to Restaurant System > Manager Functions > Define Menu Items. 2. 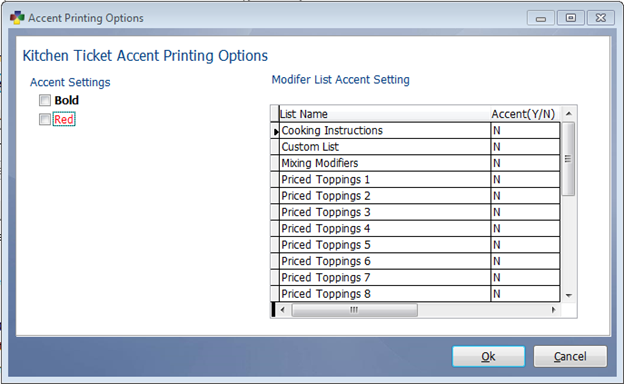 Select Modify to add an existing menu button to a group or select Add to add a new menu item. 3. Under Menu Item Options select the New Group button. 4. 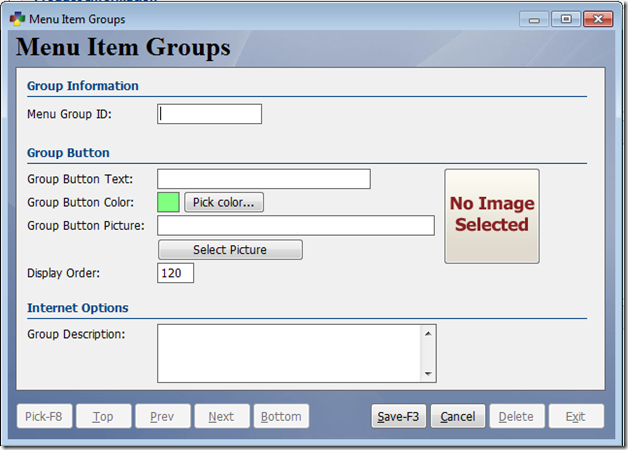 Enter a Menu Group ID and the Button Text for the group. You may also assign a color, picture, and display order number if you desire. Press Save when you are finished. 5. Press Save to save the menu item. 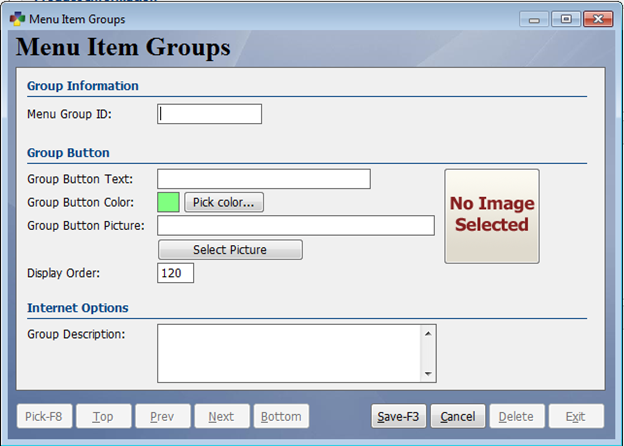 The group button will automatically be created on the menu you have assigned to the menu item. 6. Press the Pick button to select another menu item to add to the group or press Add to add a new menu item. 7. Click in the box next to Menu Item Group and press F8 on the keyboard. You may now select the group that you created in the previous step. 8. Continue adding menu items to the group in this fashion. 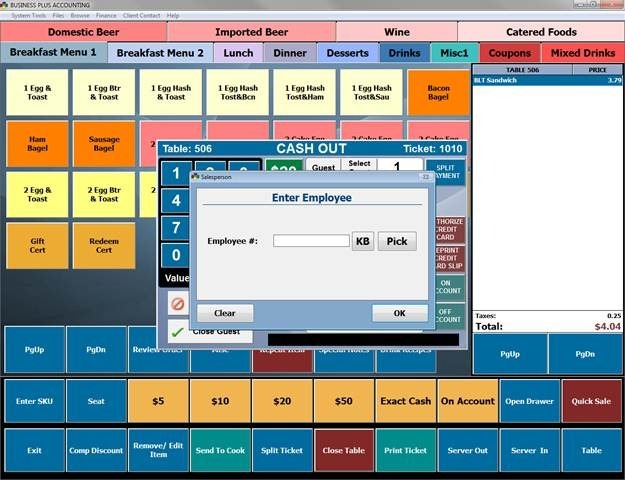 You may add as many and 24 menu buttons to a group in the Restaurant Professional software and 16 in the Delivery Professional software. In an effort to serve our customers and provide ease of configuring BPA, we have released updated manuals for BPA Restaurant Professional and BPA Delivery Professional. Whether you are a current BPA customer or new to BPA, please take a moment to look over these new manuals. 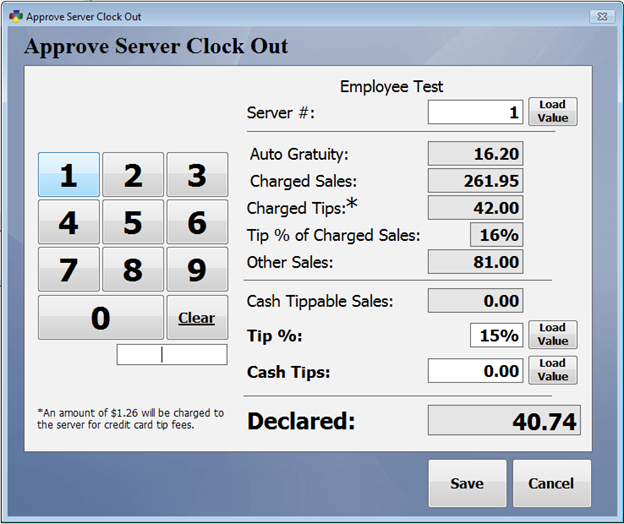 BPA has recently made changes to the software to accommodate the complex overtime calculations that are often found in a restaurant environment. Restaurant environments often have employees working multiple jobs at different pay rates. Any overtime the employee accrues is to be split proportionally depending on how many hours they have worked under each job code. Different states also have different overtime requirements which BPA now supports. 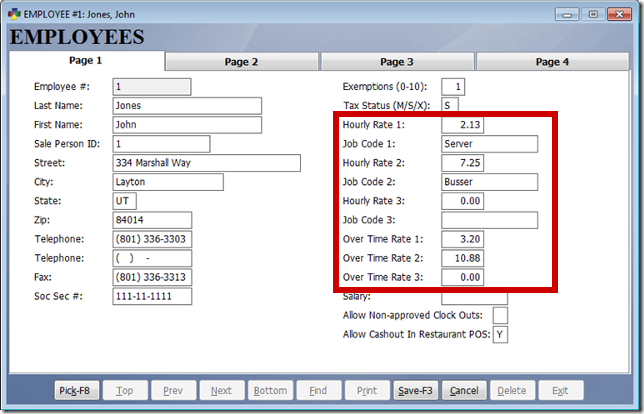 With the support of these functions we have found that often times restaurants do not have their employee rates set up properly for overtime. This guide will help you make sure your employee records are set up correctly as well as allow you to take advantage of new overtime support in BPA. 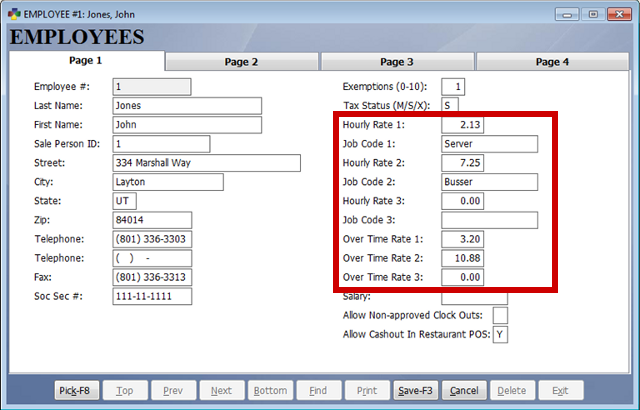 To make sure your employee records are defined correctly go to Restaurant System > Manager Functions > Define Employees. 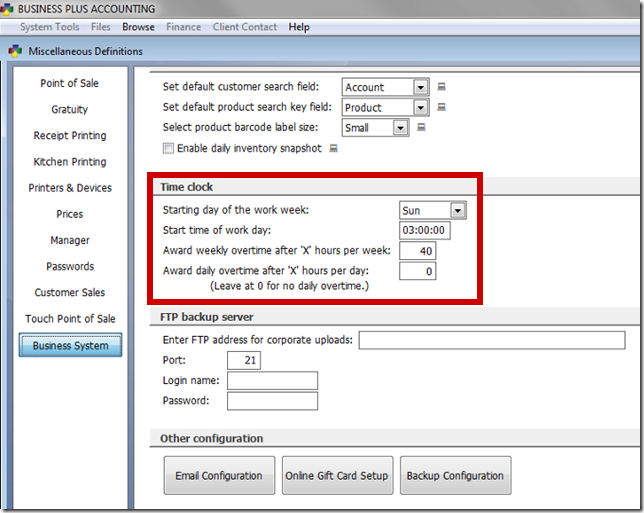 Select Modify and select an employee record. Verify that the employee has an hourly rate in the box labeled Hourly Rate 1 as well as Over Time Rate 1. If the employee works more than one job, click in the box labeled Job Code 1 and press F8 on your keyboard. Select the appropriate job code. Do the same for Job Code 2. Define Hourly Rate 2 and Over Time Rate 2. Follow the same procedures for Job Code 3 if it applies. Overtime rates should be defined for all employees whether or not you expect them to work overtime. Select Save when you are finished. Follow these procedures to verify all employee records are up to date. 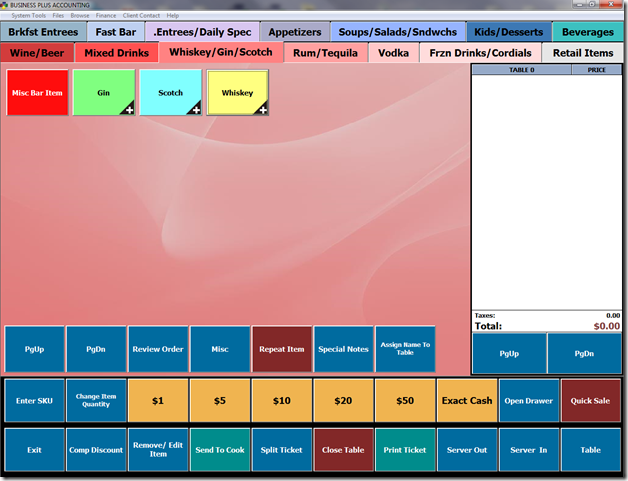 1) Go to Restaurant System > Manager Functions > Misc Definitions and select the Business System tab on the left. 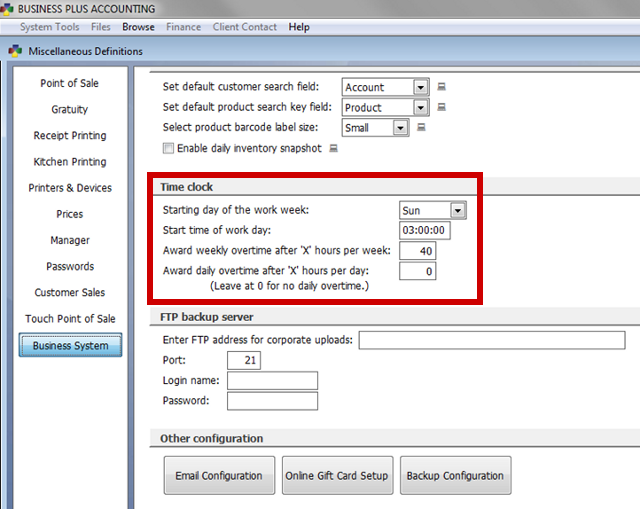 2) Under the Time Clock heading select the starting day of your work week. 3) Enter the starting time of your work day. 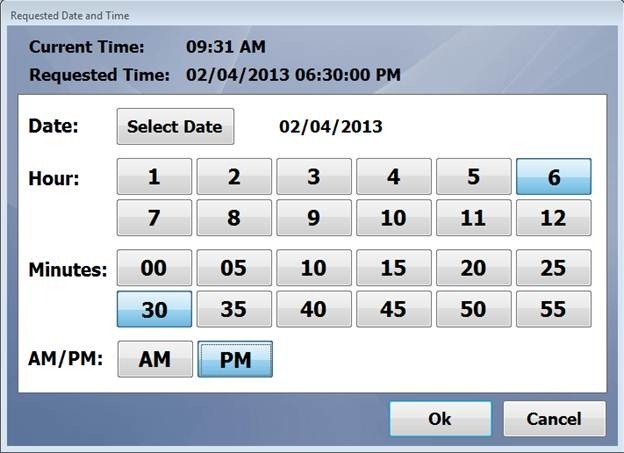 This is the time from which the software will calculate your weekly and daily overtime. If your starting day is Sunday and your starting time is 3:00 am your weekly overtime will be calculated from Sunday at 3:00 am to the following Sunday at 2:59:59 am. 4) Enter number of hours at which weekly and daily overtime are awarded. Federal guidelines are based on a 40 hour week and no daily overtime. Check with your state to find out what your local regulations require. 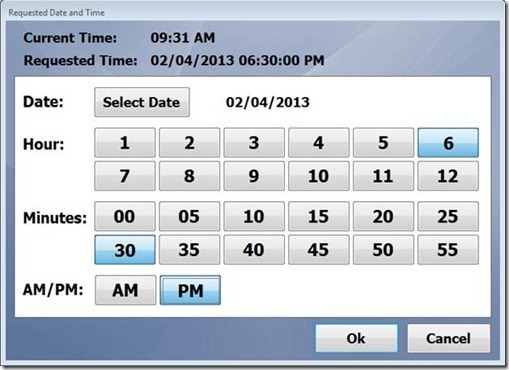 Note: Currently the BPA software does not support double time calculations. 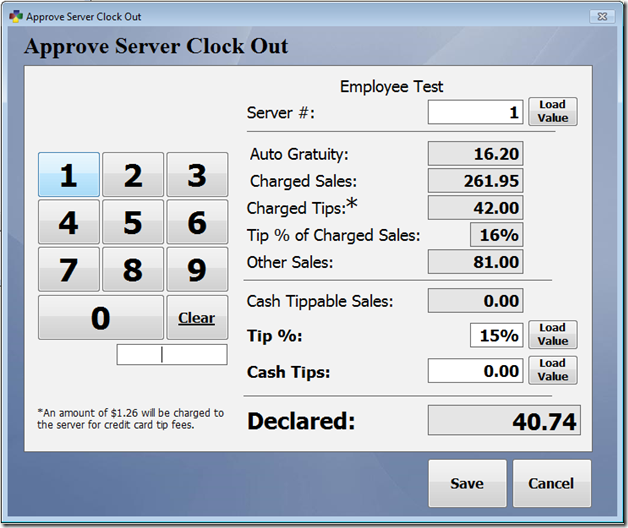 The new overtime calculations are now reflected on the time clock report. 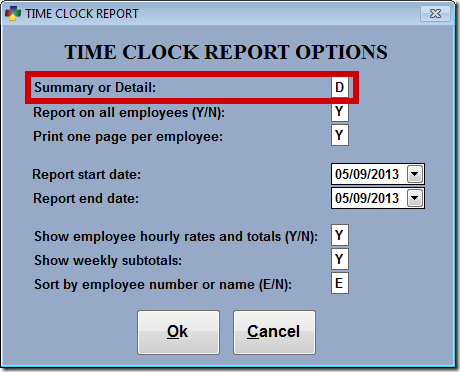 In addition, a summary report option has been added to the time clock report which allows you to print only employee totals by week. 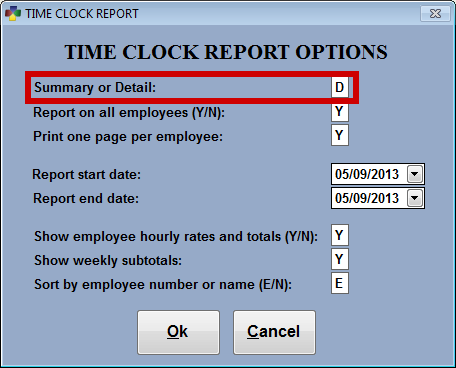 The time clock report may be run by going to Restaurant System > Server Clock In Clock Out > Print Clock Report. 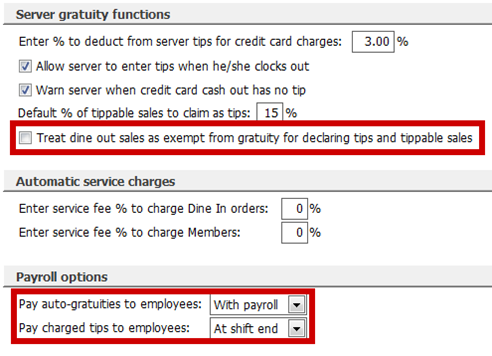 To enable employee charges go to Restaurant System > Manager Functions > Misc Definitions and click on the Manager tab on the left side. There are two options you will need to select. 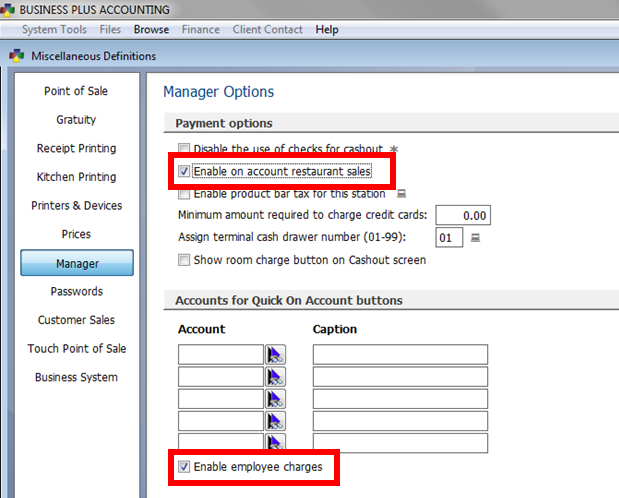 Check the boxes labeled Enable on account restaurant sales and Enable employee charges. 1) Select the Close Table button. 2) Selectthe On Account button on the right. 4) Enter the employee number or use the pick button to choose from a list of employees. 5) Select OK and then Close Guest. 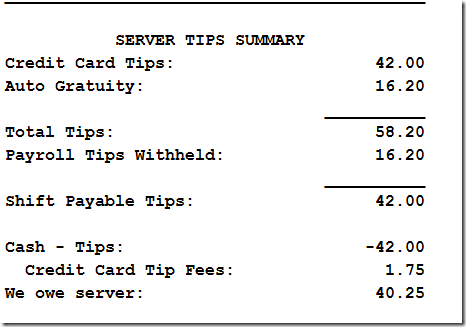 In order to track employee charges in the system you must post your table sales on a regular basis. 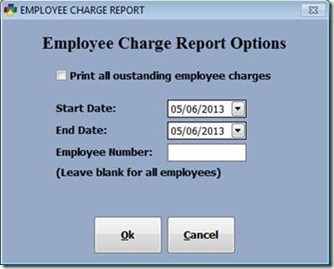 Employee charges will not show up on the Employee Charge Report until they are posted. To post sales go to Restaurant System > End Of Day Processing > Post Table Sales. To track employee charges go to Restaurant System > Manger Functions > Employee Charges. Select the Employee Charge Report. 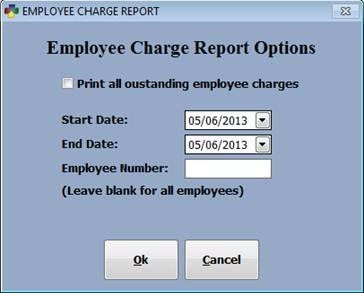 Here you may print all outstanding charges or charges during a certain date range which may coincide with your payroll. 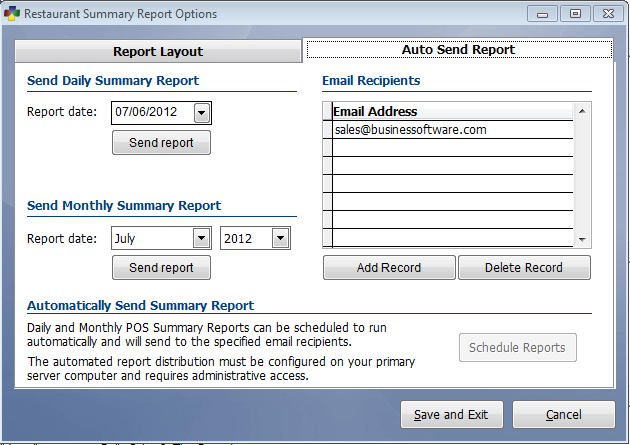 You can also choose to run the report for all employees or just a specific employee. This report can be provided to your payroll company or accountant for payroll deduction(s). 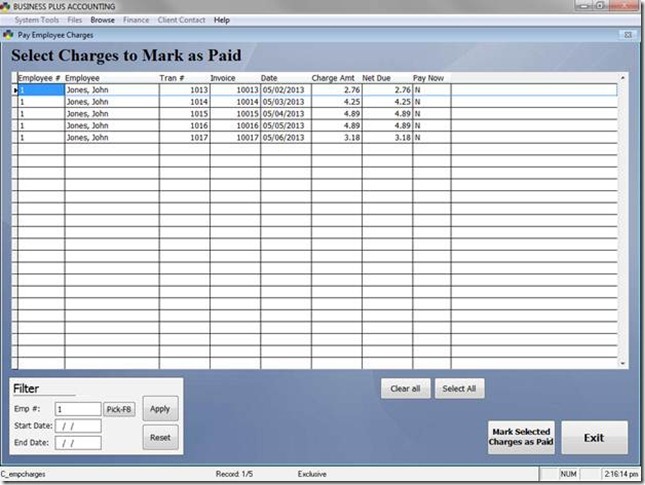 To properly track employee charges they will need to be marked as paid. 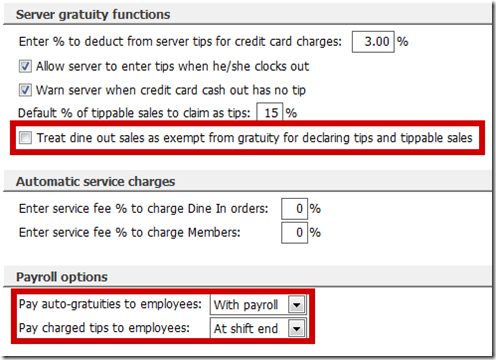 To mark employee charges as paid go to Restaurant Sales > Manager Functions > Employee Charges and select Mark Charges as Paid. Here you will see all the outstanding employee charges. You can select individual orders by simply placing a “Y” in the Pay Now column or you may use the Select All option to mark all invoices as paid. 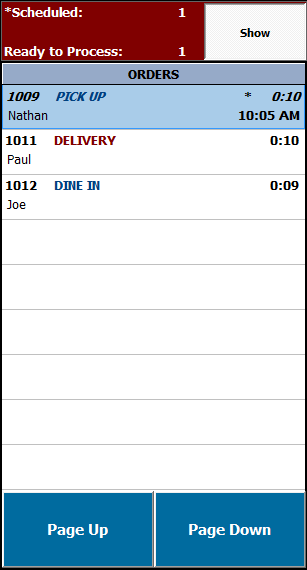 In addition you can filter the orders by employee number or date range. To mark all invoices for a pay period as paid, enter the start date and end date of the pay period and click Apply and then Select All. 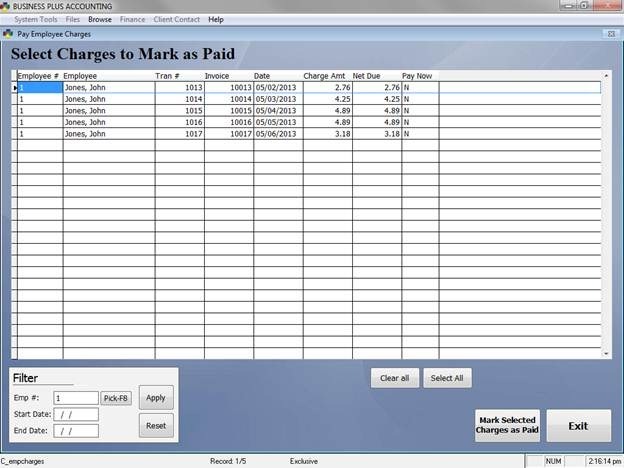 Once you have selected the orders to mark as paid, click Mark Selected Charges as Paid. You will then be asked if you would like to print a report showing the orders that were marked as paid. At Business Software Solutions we are continually seeking feedback from our customers for ways to improve our software. As a result of customer feedback we are introducing scheduled orders to the software. Now orders may be placed in advance and assigned a date and time. You may specify how long before the order’s scheduled time it will become active. Once activated, orders will automatically print to the kitchen. Kitchen tickets clearly indicate the order is a scheduled order as well as the time for which the order is scheduled. Servers may easily see when scheduled orders are pending. 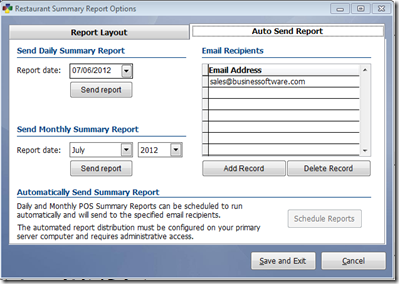 Please contact Business Software Solution for additional information and update instructions to take advantage of this new feature. In addition to scheduled orders, we have made some changes to the Delivery Software. Not only can you see scheduled orders that are pending, we have also made changes to the orders list in order to give you more information about open orders. You can now see the order type. 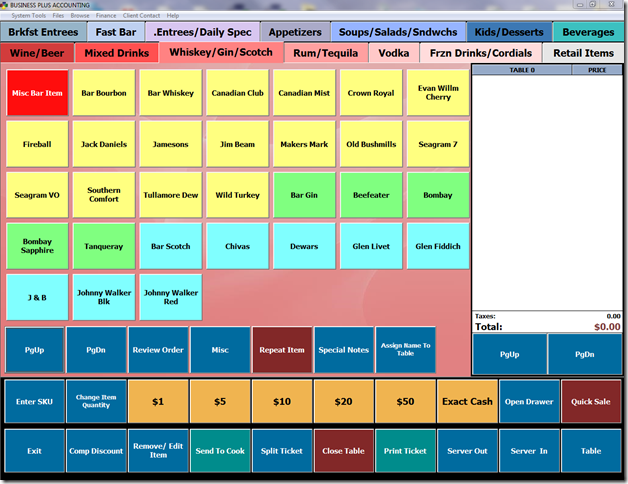 Order types are color coded and information is organized in a clear fashion. 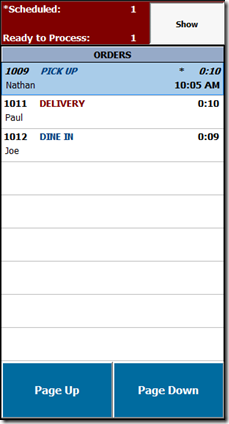 This information automatically refreshes when orders are entered from different stations. All this adds up to faster ordering and fewer mistakes.